Renovating your home and want the old sofas and wardrobes transported to the nearest landfill? Planning to clear the loft and are now faced with a pile of old furniture, you had no idea were up there? Contact us for furniture disposal in London and get your home free of any unneeded furniture. Rest assured you will be visited by an expert team, ready to load all your home or office furniture and have it removed of the premises. No matter the size or the number of your unwanted items, we have the skills and expertise to make them disappear. Simply dial 020 3404 4868 now and let us do what we do best! You have probably heard your friends and neighbours talk about hiring a skip when doing house refurbishment. If you have found yourself in the same situation, we have a better solution. Forget wasting hours, and even days talking to the council for a permit. Forget paying a flat fee for a skip hire, despite the fact you only fill half of it. Forget doing any heavy lifting, carrying the furniture to the skip. We at 24/7 Waste Removal have a better idea! Call us now and enjoy a fast and affordable furniture collection service. We also offer many great benefits. We are dedicated to protect the planet we live on, and will send all recyclable furniture for recycling. You will enjoy a complete service – loading, transportation and disposal, leaving you with a waste free property. No need to leave a deposit in advance, just pay at the end of the service. Our prices are based on the actual amount of furniture we remove and amongst the lowest in the business. We are aware of the wide variety of furniture in one’s home or office and are trained to remove each and every one of them, in a quick and effective manner. You can expect top quality sofa disposal and a lot more. Wardrobes, beds, bedside and dressing tables, chests of drawers, mattresses. Sofas and armchairs, storage and shelving units, coffee tables, TV stands and cabinets, console tables. Cot and bunk beds, desks and chairs, playgrounds. Dining tables and chairs, stools and benches, sideboards, free-standing and modular kitchens. And if you are still wondering what to do with the old fridge-freezer or oven, the white goods disposal team has the answer. Benches, barbecues, umbrellas. And if you want to make sure your green space is completely junk free, talk to the garden waste clearance experts. Shoe cabinets, racks and stands, hooks and hangers, baskets, portmanteaus. How to Recognise the Mattress Disposal Experts? Hiring us for mattress disposal guarantees you will receive a service tailored to your needs and with your budget in mind. Every one of the team members is fully vetted and extensively trained in providing first class services. 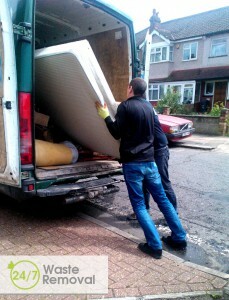 "I had an old sofa that needed to be thrown away and these guys did that for me with no hassle. I will definitely use 24/7 Waste Removal again!" Get Affordable Furniture Disposal Now! Get the best furniture disposal available in London by calling 020 3404 4868 now! Call our advisers 24/7 to get a free, no-obligation quote. We will provide you with a price quote based on the amount of furniture you want from us to remove. For online contacts, fill in our contact form. We are always ready to help you out.